Cameras Downunder Gallery - Light Meters & Flashes, Shutters & Rangefinders/BEWI meter, Photo 2. A special version of the Tele-BEWI meter, for extinction exposure metering, and Rangefinder, also Telelens f-stops. 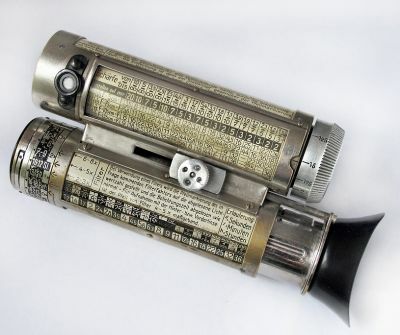 The rangefinder (according to the angle mirror principle) was also available individually, complicated unit, very rare. Made in Germany. Ca. 1935-40 ? Back view.